The Model B3 Chair, commonly known as the Wassily Chair, is arguably one of the most recognizable designs of Marcel Breuer - the legendary modernist and an iconic figure of 20th century architecture and design, who abandoned the idea of ornamental, bourgeois forms in favour of elegant simplicity. Breuer was still an apprentice at the Bauhaus when he designed the Model B3 Chair, the chair which would change the world of furniture forever. The origins of the Wassily Chair can be dated back to the beginning of the Modern Movement. In contrast to the historic trend of incorporating the past in furniture design, this era was defined by the idea of making timeless, universal objects that would resist the passage of time. This belief led to more simple, pure designs that were less prone to becoming obsolete. The concept of the simplified design was later developed by the Bauhaus, with which Breuer was closely associated. The main principle of the Bauhaus was to make everyday mass-produced objects beautiful yet practical and still attainable by ordinary people. Breuer’s involvement with that famous German art school began when he was just 18. He was one of the first and youngest students in the school’s history. His talent was quickly recognized and soon after he became the head of the carpentry shop, where he would conceive a multitude of iconic furniture designs. The Model B3 Chair was first introduced in 1925. Its exceptional form was enthusiastically received by the Bauhaus and just one year later the entire facility was furnished with this modernistic furniture. The chair went into mass production in the late 1920’s and was initially manufactured by Thonet, the German-Austrian furniture company most known for its bent-wood chair designs, under the name of ‘Model B3’. Its production was brought to a halt during World War II. After the War years, Gavina, the Italian furniture company, picked up the license for the chair and named it after the non-objective painter and a colleague of Breuer's at the Bauhaus, Wassily Kadinsky. 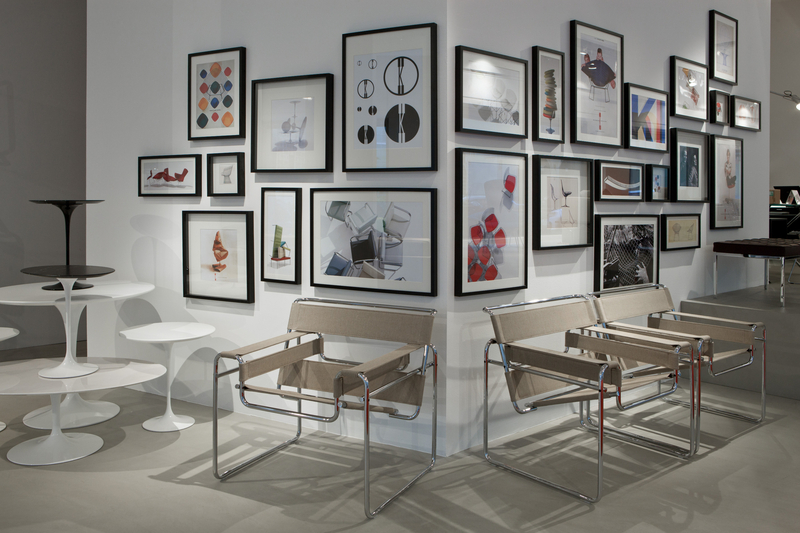 Currently, the Wassily Chair is available under the Knoll brand. Indeed, the form of the Wassily Chair is famous for its transparency. It can be attributed to its distinctive chrome coated frame made of bent steel circular tubes, which are connected with screws. Thick cowhide leather slings spanned on the frame create the chair’s seating surfaces, which are able to maintain their crisp tautness for decades. Customers can choose from three types of leather: Spinneybeck® Belting Leather available in 27 colors with edges dyed to match; white, beige and light brown Spinneybeck® Thick Cowhide Leathers as well as 8 options of Spinneybeck® Haired Hide. Each Wassily Chair has the KnollStudio logo and the designer's signature engraved on the base. The overall appearance of the chair is extraordinarily appealing and stylish. It is very proportional and well-balanced and the use of the frame makes it look both airy and light. In contrast to fully-upholstered furniture, it does not obstruct the room in which it is placed but enhances the perception of spaciousness. Even today, almost nine decades after its presentation, when modernism is not an extravagant or radical concept anymore, the Wassily Chair has neither aged nor become trite. It still looks fresh and contemporary. Despite the popular belief, Breuer did not design the chair especially for the painter Wassily Kandinsky, who was also working on the Bauhaus faculty at the time. Breuer later recalled that: “I was myself somewhat afraid of criticism. I didn’t tell anyone I was doing these experiments actually [experimenting with the designs incorporating bent steel tubes] . Kandinsky, who came by chance to my studio when the first chair was brought in, said, ‘What’s this?’ He was very interested and then the Bauhaus got very interested in it.” Breuer presented Kandinsky with one of the first prototypes of the chair as a gift. The anecdote regarding the connection between the chair and the painter was later picked up by the Gavina furniture company, which gave the chair its name - “Wassily”. Initially, the chair was available in both a folding and a non-folding version. In those early variants, the fabric straps were pulled against the frame with the aid of springs. The chair was available in only two colours: black and white. The chair can be seen in a multitude of cinematic productions, including: House M.D., Frasier, X-Men First Class and Revenge. Marcel Breuer was not only a furniture designer but also an accomplished architect. He was awarded with the Gold Medal of the American Institute of Architects at the 100th annual convention in 1968 in Portland.